Copyrighted photo of Leilani's silicone massage cups placed on the back of a model client. Pamper and treat yourself with a facial, neck, and scalp massage, gentle facial cupping, and facial moisturizing. Vacuums and lifts the facial tissue with special facial cups, drains toxins and lymph, increases circulation and nutrition to the skin, softens scar tissue, and plumps wrinkles and lines. Session lasts approximately 50 minutes (including 10 minutes on the table of rest). This can be added to another type of service and works wonderfully with a full body massage or foot massage. Copyrighted photo of Leilani's facial cups and cupping therapy tools. For a real luxurious treatment, indulge in a half hour hot stone massage or hour massage and a facial cupping massage in combination the same day or foot session with the marine-therapy pedi-spa scrub and balm! For pricing check our Frequently Asked Question page. 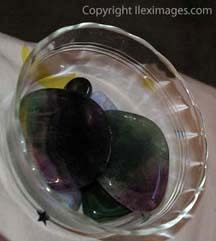 This photo shows the actual cooling gemstones used in the facial massage including amethysts, blue lace agate, hematite, tourmaline, and malachite. 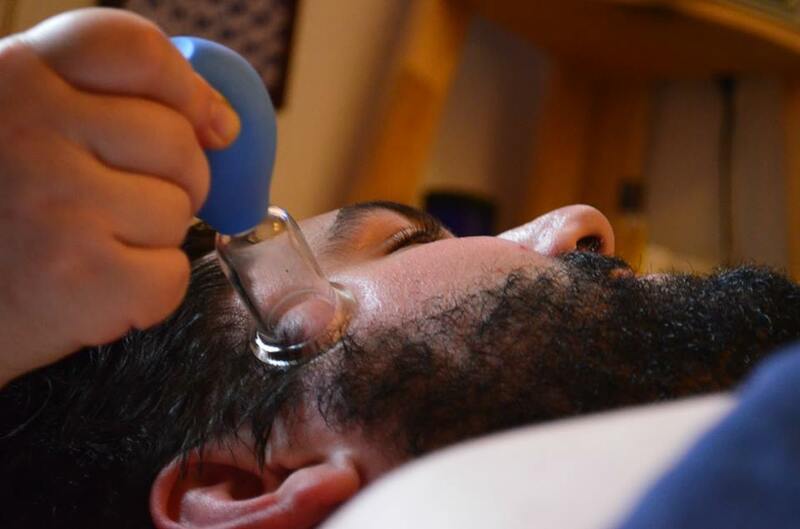 This facial massage is not an esthetician service nor is "facial"; it is a face and neck massage and cupping provided by a massage therapist and certified cupping therapist. For facial skin treatment like extractions, peels, microdermabrasion and waxing, you must seek a qualified esthetician or dermatologist. Leilani took this picture at the Mt. Vernon Orchid Show Feb. 2007. The AromaSpa offers private luxurious steam and aromatherapy services. Combining steam and massage will make for total relaxation of the mind and body. The AromaSpa is currently unavailable until more office square footage is available which will hopefully be set up in 2018. We apologize for the inconvenience. Shower, towels and robes are available. 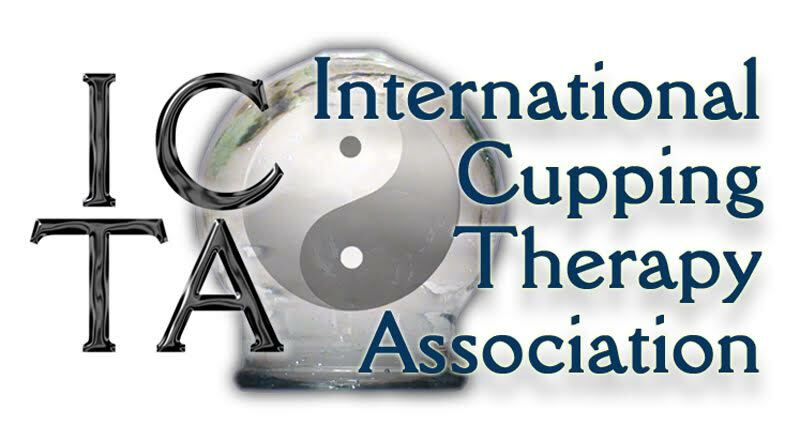 One of the oldest most practiced medical treatments in human history: cupping therapy. Excellent for circulation, reduces pain and muscle tension, stretches connective tissue, improves range of motion and lymph drainage, helps with digestion, reduces cellulite, relieves congestion, and improves skin texture and tone especially noticeable in the face. This amazing negative pressure treatment is great for back pain, shoulder tension, scar treatment reduction, asthma, sinus congestion, headaches, carpal tunnel syndrome, headaches, low back and hip pain, piriformis syndrome, tendonitis, bursitis, chronic pain, jaw pain, sciatica, whiplash, IBS, dizziness & vertigo, menstrual discomfort, frozen shoulder, plantar fascitis, foot and heel pain, muscle tightness, sports injuries, cellulite reduction, tattoo refreshening, stress, relaxation, and excellent in conjunction with other therapies like physical therapy or chiropractic. It�s essential to drink water before and after your cupping session. is quickly becoming one the most requested massage treatments. It includes the use of special oils, uniquely chosen volcanic rocks for a relaxing penetrating heat therapy and cooling with gemstones while providing a unique pampering and relaxing massage service. This is a special service that is tailored to your desired result from the your massage session whether that be for stress and tension relief, injury rehabilitation, pain relief or pampering. For pricing check our Frequently Asked Question page. 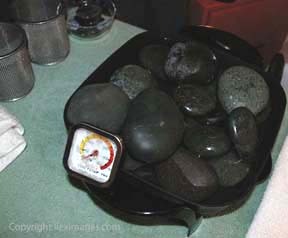 This photo shows the actual stone used and the thermometer we use to motor the temperature keeping the stone at safe levels. The stone and all equipment used are both cleaned and sanitized after each use. Stones are used in stationary placement in various positions and are employed in direct massage strokes for a deeply relaxing massage as this photo shows Leilani using the stones during a hot stone massage session. Aromatherapy is the treatment of the body and mind through the use of potent high quality flower/herbal essences specifically blended for relaxation, improved respiration, healing sore muscles, general well-being and balance, and the stimulation of the body's systems or skin conditions. 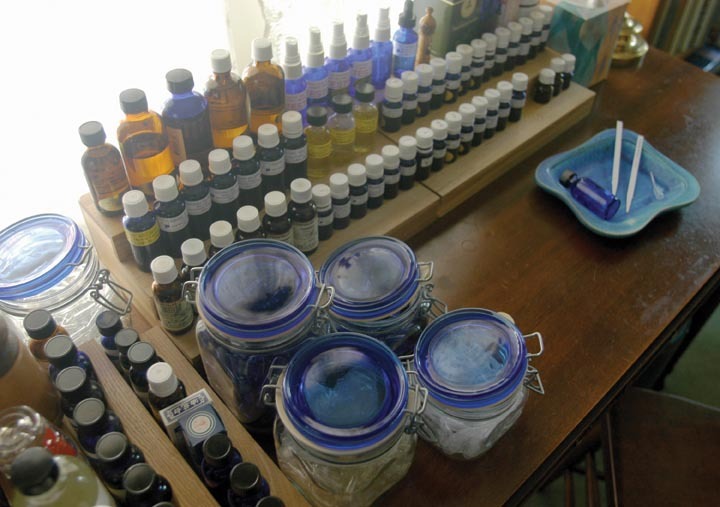 As a part of the hour long reflexology treatment, a brief optional aromatherapy foot soak with essential oils is optionally included in your session. For more information, about foot massage and reflexology click here. 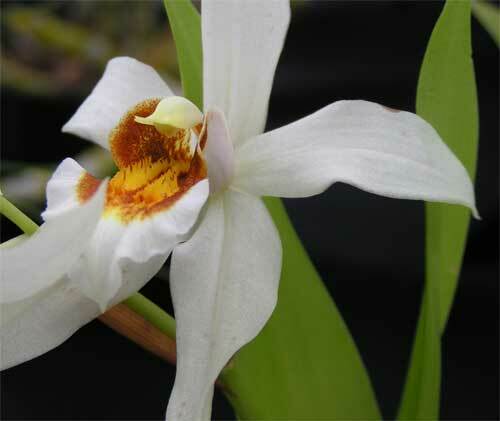 Based on in stock availability just ask for a smell and we will share with you what your choices are today. This photo is provided courtesy of Associate Bodywork & Massage Professionals www.abmp.com of which Leilani Berry has been a member in good standing since 1994.